Mikaele Oloa: 18 Time Fire Knife Champion! Mikaele is the third of the Oloa Children has begun dancing at a young age and is most known for his ground-breaking Samoan Fire Knife performances. At the age of 15, he was and is STILL the youngest competitor to have ever won the title of World Fire Knife Champion and has capabilities of dancing with up to four fire knives! He has performed throughout the world ranging from North America--coast to coast, Samoa and Japan. Not only is he an award-winning Samoan Fire Knife Dancer, but he has also won many awards in Tahitian dance and drum. 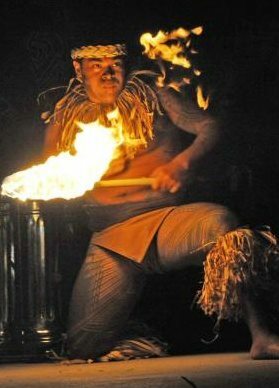 He is an instructor of Kalena's and is the co-founder of the Samoan Fire Knife Dance club: Mauga Mu, where he trains young girls and boys in the art of the dance. He has started to begin his own line of products adorned with his very hand-painted designs of the Samoan tatau. More details of that line to come soon! Nicki Minaj's Music Video "Starships"
Anuhea's Music Video "Mr. Mellow"